Mongolia is said to be the last great nomadic nation. Like any country, Mongolia has its share of problems. Large numbers of nomadic people migrate to the capital only to find high unemployment, few prospects and no way back. Many turn to alcohol and are forced on to the streets or underground to keep warm next to the city’s hot water pipelines. Nevertheless, Mongolians are proud and optimistic. With large amounts of precious minerals attracting foreign investment, they are hoping for a brighter future. Mongolia’s capital city Ulaanbaatar is home to a third of the country’s population. The vast Ger District slum surrounds the city on three sides and is home to around a million people. 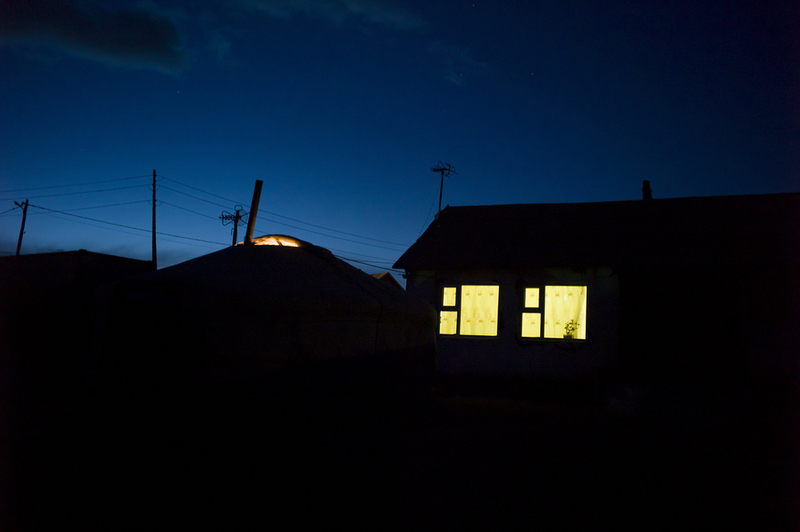 Most families live in a Ger, or a Yurt as it is known in the West. All Mongolians are entitled to 50 square meters of land, but they must claim their land before someone else does. Troy Tvrdik, an American NGO, takes me on his ‘Ger District Tour’. “Everyone has a fence, there are fences around everything,” he says “One reason for this is privacy. Most Mongolians don't want people to know what they're buying, what they have, or what they're doing”. "IF THEY HAVE 50 LITRES OF WATER, I COULD ASK FOR 25"
“Behind every fence is a dog. Mongolians are afraid of dogs, so it’s the perfect security system. So with fences, I have to knock first and they have to put their dog away. Then I can come in. It also gives them time to hide everything so I can't see what they own and ask for it. In some areas of the Ger district tower blocks provide more solid living conditions, but most are poorly built, badly maintained and often lack basic heating systems. With temperatures falling to -40C, the winter can be long and merciless. At least a Ger can be heated easily and cheaply by comparison. Each high-rise has an ‘Orts’. This is essentially a cupboard under the stairs, where brushes, mops etc would normally be kept, or a basement where the heating system and pipes are. Often whole families live in these tight spaces suffering all the stresses associated with raising a family in a ‘home’ often no bigger than a wardrobe. A Mongolian woman agreed to show me where she and her husband live. There is a cramped space for sleeping, washing and cooking. She explained they were poor, that they did not and could not receive support from the government. She had nothing. Under the current government each Mongolian is given 21000 togrog, the equivalent of £10.60 ($16) per month in allowance. Like many others, the woman was unable to claim the money because she did not have access to necessary documents. Many people do not have a birth certificate and cannot afford to pay for one. Often their identification has already been taken and sold for political gains. As I was leaving the woman began to weep. It was as if she had realised how bad things were.